President Donald Trump honored the 2017 Alabama national championship team on the South Lawn of the White House on April 10, 2018, after meeting with Nick Saban and team captains in the Oval Office. Coach Nick Saban and the extraordinary group of players — and they are extraordinary and they’re going to be very rich — gather here. Congratulations on your incredible victory. It truly was a win for the ages. I don’t know if you know, but I was there. I was there. I got to see it. 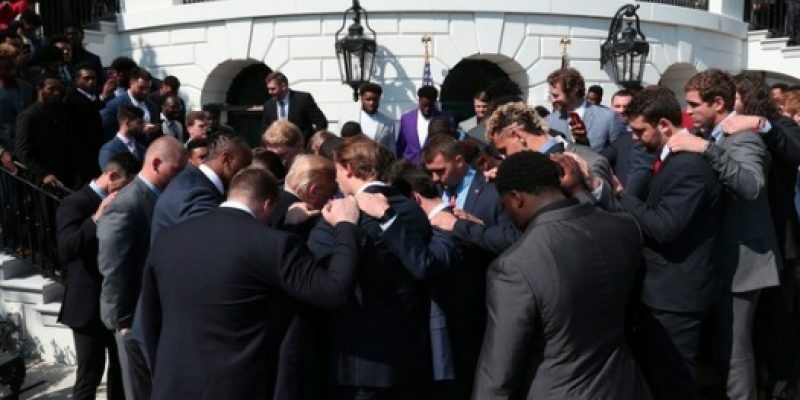 The University of Alabama Football Team met with President Trump in the White House to celebrate their national title win, and as the president was shaking players’ hands, punter JK Scott, the Ray Guy Award finalist, asked him if he could pray for him. Standing in the risers on the White House south lawn, “Scott said he was overwhelmed with compassion when Trump took the podium,” Alabama.com reported. Really the whole point of me laying my hands on him was not to be touchy feely but it was truly to say, God, everything that you’ve done in me. Everything you’ve shown about me and my identity and this love you’ve given me and transformed my life, I’m asking you to do that in him. After he finished, Trump thanked him and gave him a hug. Trump said, “Thank you so much. That was so beautiful,” Scott said. Trump was at the championship game, actually on the field before Alabama beat Georgia in overtime in January. He watched the first half from a suite in Mercedes-Benz Stadium and left at halftime when Alabama was behind 13-0.